If you’re a fan of sorcery-based slot machines, the Witchcraft Academy slot machine will likely excite you. It’s loosely based on a rather successful franchise that’s also focused on adolescents learning to cast spells, summon creatures, and perform divinations, as well as getting into plenty of spots of bother along the way! In terms of specifics, the Witchcraft Academy slot machine is played across four rows and five reels. There is a total of 20 win lines active on every spin and a whole host of special features to keep the action entertaining on repeat visits. Another element that sets the Witchcraft Academy slot machine apart from others is its effort at a narrative. If you click on the “information” option on the main game screen, you’ll get a background on the two young sorcerers you’ll be adventuring with. It’s hardly Shakespearean stuff but the thought is nice! Strong theme. Fans of a certain school of witchcraft and wizardry will likely love this machine. Great second screen bonus mode. 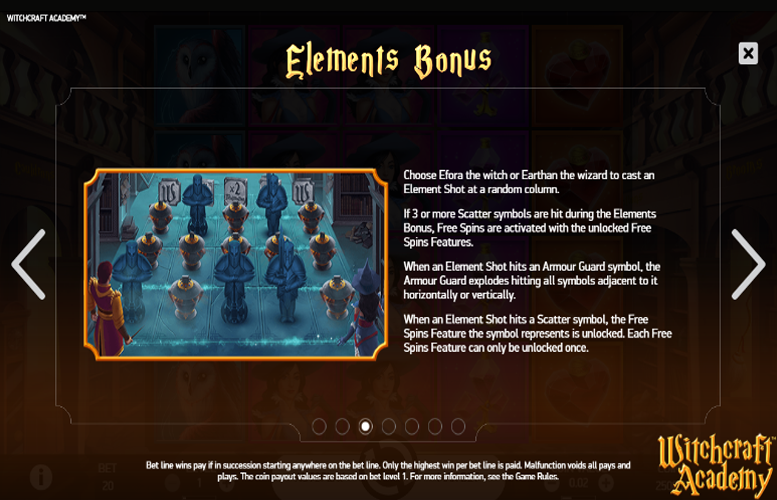 The Elements Bonus has all the makings of a classic slot machine feature. The animative touches are great and really add to the title’s overall enjoyment. There has been some effort of a narrative behind the action. It’s not exactly the strongest but it’s the thought that counts! Some might find the theme a little juvenile. Witches and wizards certainly aren’t for everyone! Earthan= 400x the line bet. Efora = 200x the line bet. Dragon = 100x the line bet. Owl = 80x the line bet. Note: max coin top jackpot is 160,000 coins. Landing three or more “Scatter” symbols anywhere on the reels during the main game will activate the Elements Bonus. During this special feature, players must choose either Efora the witch or Earthan the wizard to cast an Element Shot at a random column. 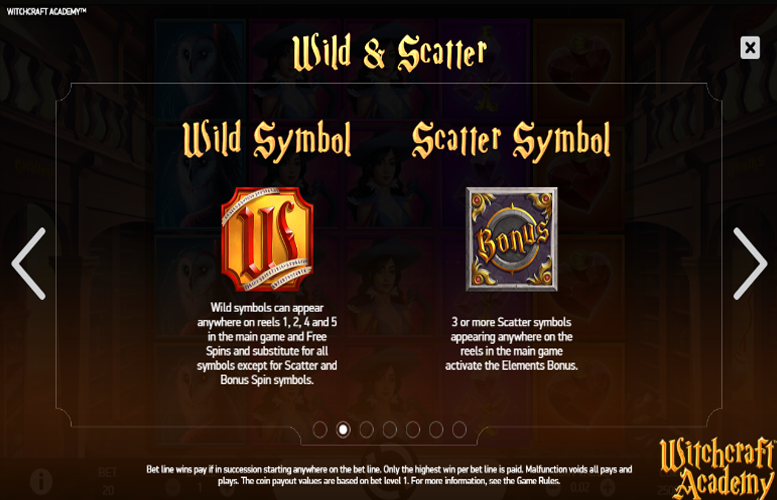 If three or more “Scatter” symbols are hit during the Elements Bonus, Free Spins are activated with the unlocked Free Spins Features. When an Element Shot hits an Armour Guard symbol, the Armour Guard will explode, sending shrapnel spraying out to hit all horizontally and vertically adjacent symbols. When an Element Shot hits a “Scatter” symbol, the Free Spins Feature the symbol represents is unlocked. Players should note that each Free Spins Feature can only be unlocked once. 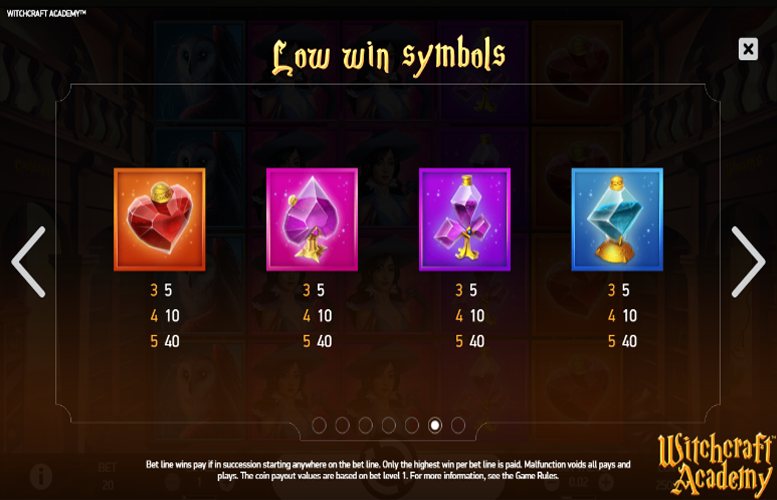 Collecting three or more “Scatter” symbols in the Elements Bonus will activate five Free Spins with the unlocked Free Spins Features. Two “Bonus Spin” symbols = 5 Free Spins. Three “Bonus Spin” symbols = 10 Free Spins. 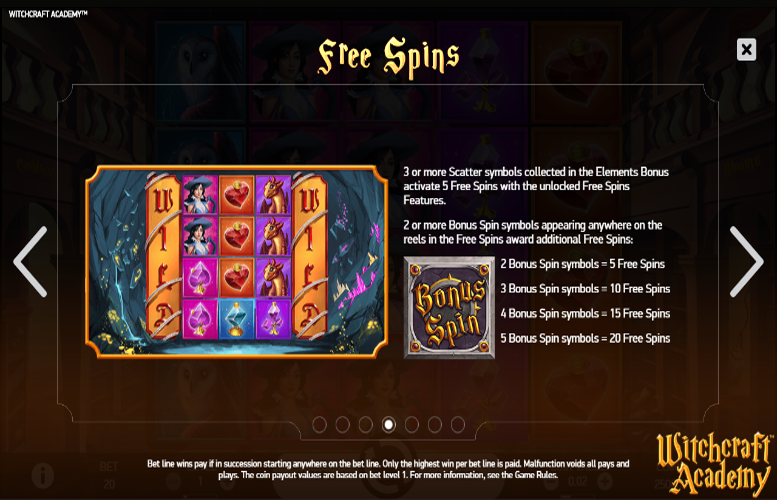 Four “Bonus Spin” symbols = 15 Free Spins. 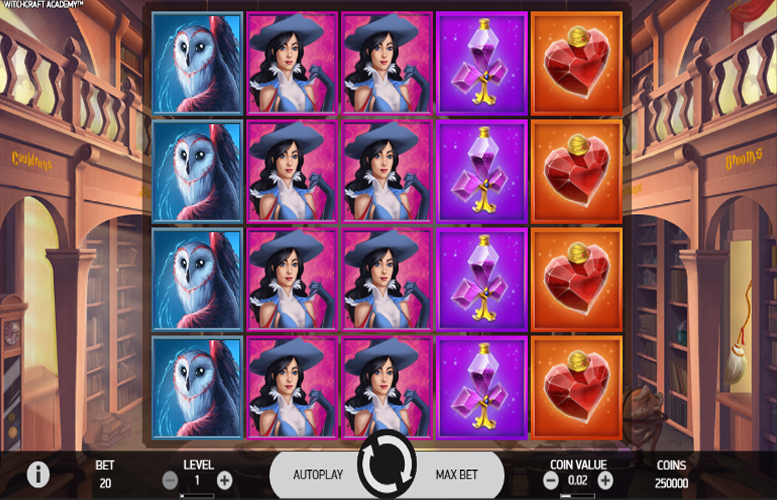 Five “Bonus Spin” symbols = 20 Free Spins. Heart, Spade, Club, Diamond = 40x the line bet. The number of win lines on the Witchcraft Academy slot machine is fixed at 20. This means that players are only able to adjust the number of coins bet on each, as well as the value of them. The maximum and minimum values for the number of coins are 10 and one respectively. Meanwhile, the coin values can be set at various intervals between 1p and £1. This means that when all the values are set to their minimum, the lowest cost per spin is just 20p. Conversely, with everything maxed out, the largest possible bet per spin is £200. Whilst some of the highest rollers around might find this a little limiting, most players will find it more than enough. 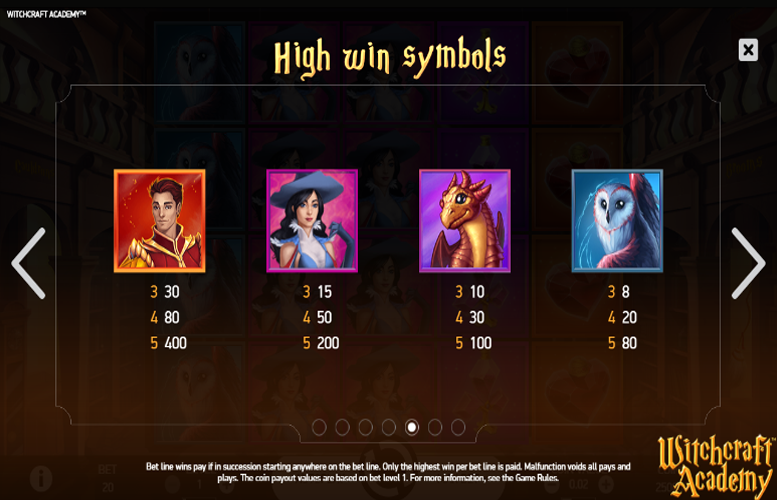 All told, the Witchcraft Academy slot machine is a great title from one of the industry’s most well-known and best-loved designers – NetEnt. However, the similarities of the title to a wildly successful movie and book franchise will either make you love it or hate it. Some will find the subject matter of witches and wizards nauseating. Meanwhile, others will find it, well, enchanting. The game has a few innovative special features. The most notable is the Elements Bonus. It comes complete with an amazing second screen animated game! It’s also tastefully animated so even if you’re not interested in the subject matter, there is still plenty to enjoy about the game. This game has a rating of 4 / 5 with 394 total reviews by the users.